HI….I AM SASANKA MAITI FROM KOLKATA . I HAD SUBSCRIBE APY BUT TILL NOW I DON’T KNOW HOW MANY RUPEES SAVINGS IN MY ACCOUNT.KINDLY SUGGEST PLZ. If I will join Npa scheme and after some year I dead.what is the amount to be paid to my nominee. hi sir , i am private employee in private company but i am not getting any pf facility . can i opn atal pension yojana accounts?? I opened APY in a branch of ASSAM GRAMIN VIKASH BANK. Bank Branch manager said that under this yojna Three people can get benefit. Firstly I, if I attained 60 yrs old. After that the person whom i nominate for my nominee and my nominee can also nominate one nominee. I am Income Tax Payer and also contribute in EPF scheme. Can I am eligible for this scheme? Any Life Insurance or accidental benefit in APY Scheme.what will be the benefits. sir, Mera APY PRAN Card online check karne pr show nhi kar rha & mere account m 2016-2017 m 1000 Rs nhi aye jo ki five years tak aane chahiye h. Please answer me. i want to know one scenario of this case. 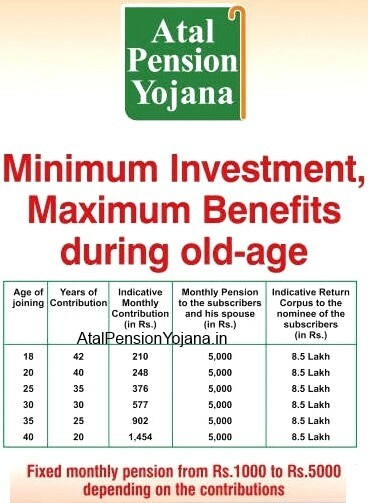 Any individual over 18 years old and beneath 40 years can benefit this plan.http://www.atalpensionyojana.co.in/apy-premium-plans/ When you join this plan you should put resources into this store till you move toward becoming 60 years of age. Residency for which you would need to put cash in Atal Pension Yojana. Assume you are 21 years old then you should contribute around 39 Years. is this information is right? how can i confirm that whether nominee & Spouse Name are applied/correct is there any Profile Status/Proof. My account got auto debited for APY but I don’t get my APY PRAN No. and don’t have document for APY account. I have only the bank statement that amount is deducted for APY. Please tell me that, is there any account proof document for this investment. mera epf account hai but vo purani company me tha, maine new join kar li hai. jisme epf ni kat raha. so mujhe government ki taraf se share milega? i m not a tax payer.